When 5-year-old Paul Melchiorre danced with Princess Ariel at Walt Disney World in April, it was the fulfillment of a big wish. But he had just fulfilled a much bigger one. “Isn’t that incredible?” she asked. A year earlier, Paul underwent a heart transplant at Monroe Carell Jr. Children’s Hospital at Vanderbilt. His condition made him eligible for one of Children’s Hospital’s many valuable community partners. Children’s Hospital works with Make-A-Wish to identify children with life-threatening illnesses who may have a wish granted—the wish being driven by the child’s or youth’s imagination. Paul chose a trip to Disney World. José Gonzalez, 10, who had a heart transplant in March 2016, also chose Disney World and went in September as a result of the partnership between Children’s Hospital and Make-A-Wish. Like Paul, José spent months in the hospital waiting for a heart. José’s mother, Yuridia, needed a place to sleep for the long stay because her home is two hours away in Winchester, Tennessee. That’s where another of Children’s Hospital’s community partners stepped in—The Ronald McDonald House of Nashville—a home away from home for out-of-town families whose children are Children’s Hospital inpatients. Hospital social workers refer families to the House. Here is a closer look at these two partners, and how they work closely with Children’s Hospital to care not only for patients, but also for their families. Make-A-Wish was once for children who had a terminal illness, but that’s no longer the case. Any child with a life-threatening illness can have a wish fulfilled through the organization. “It became clear that he needed a new heart to survive,” Melchiorre said. Paul spent almost five months in the hospital, waiting for an organ donor. Meanwhile, Colleen applied to Make-A-Wish for Paul, and the team at Children’s Hospital backed the request all the way. It became apparent that Paul wanted to go somewhere. “We put out Mickey Mouse and trains and princesses, all these different things and he ultimately decided that he wanted to dance with a princess and that was his wish,” Melchiorre said. Anyone can apply to Make-A-Wish just by going to the organization’s website, middletennessee.wish.org. Many others are referred by social workers or Child Life specialists at Vanderbilt. To qualify, children must be between 2 1/2 years old and 18 years old and have a life-threatening medical condition at the time of referral. Once a wish has been requested, the foundation sends two volunteers to visit with the family and discuss the details of granting a wish. For example, going to Disney World, becoming a superhero for a day or donating goods to an orphanage are all wishes that have been fulfilled. After a wish has been determined, the organization handles the rest—travel planning, logistics, everything without cost to the family. Ultimately, a medical professional treating the child must approve that the child is healthy enough for a wish before it is granted. None of this would be possible without the local Make-A-Wish chapter’s partnership with Children’s Hospital, which dates back to the founding of the chapter in 2000. The hospital by far represents most of the local chapter’s patients, and the two organizations work hand-in-hand to ensure a wish is an option for all patients who qualify. Children’s Hospital’s target is to refer about 15 patients a month to Make-A-Wish, said Janet Cross, M.Ed., CCLS, CPXP, administrative director for Patient- and Family-Centered Care at Children’s Hospital. “We are grateful the partnership has become so strong,” Torres added. Make-A-Wish serves 38 counties in Middle Tennessee and granted 134 wishes last year. But Torres wants to serve even more. She sees the positive change in children who have had a wish granted. It also fits with the Vanderbilt University Medical Center mission of patient-and-family centered care, said Allen Sills, M.D., FACS, professor of Neurosurgery, Orthopaedic Surgery and Rehabilitation, who serves on the board of the local Make-A-Wish organization. Make-A-Wish offers many families an opportunity to make a memory they otherwise couldn’t while they shoulder the cost of health care. But it is not restricted to families of certain means; any child with a life-threatening condition can qualify for a wish, regardless of socioeconomic status. Torres said fulfilling a wish is an opportunity to give a family a moment of normalcy during a time when their life has been turned upside down by their circumstances. Melchiorre agreed. Paul’s surgery was successful. His condition will always need to be monitored, but he is living a normal life, full of bounce houses, soccer and ballet. “His intellect and his heart and his emotions have not been scathed,” Melchiorre said. “He is so brave. So smart. So cool. José Gonzalez spent about a year at Monroe Carell Jr. Children’s Hospital at Vanderbilt, waiting for a donor heart. Like Paul, José, 10, has hypoplastic left heart syndrome, and was too ill to leave the hospital. His mother, Yuridia, was at his side for much of that time. But when she needed a place to sleep, the Ronald McDonald House of Nashville was essential. She is from Winchester, in southeastern Tennessee, a two-hour drive away. The cost of buying a nightly hotel was prohibitive, and staying in José’s hospital room, while doable for short periods, wasn’t ideal. She found a home at the House. The Ronald McDonald House, partnering with Vanderbilt since opening in 1991, is a home away from home for patient families that is just a short walk from the hospital. More than a place to rest, it offers hot meals, a laundry room, playroom, library and two kitchens, as well as emotional support from staff and other families going through similar circumstances. “We have all the comforts of home, but it’s just on a larger scale,” said Elizabeth Piercy, executive director of Ronald McDonald House Charities Nashville. The house has 32 bedrooms and 37 bathrooms. Piercy said the House’s mission is to keep families close—to the hospital and to each other. Since the House opened, more than 13,960 families have come from across Tennessee, Kentucky and 41 other states, U.S. territories and 14 foreign countries. Gonzalez said it’s important to have a place to relax and sleep while caring for a sick child. “The place is nice. It’s quiet,” she said. The Nashville House serves families with a sick family member from the age of birth to 18 who are referred by a hospital social worker. It requests that families pay $15 per night, but nobody is ever turned away due to means. In 2015, 91 percent couldn’t afford to pay anything, and 9 percent paid a partial fee. Up to four family members can stay at a time. While José was in the hospital, his little sister, now 4, could stay with her mom at the Ronald McDonald House. José’s father, also named José, worked during the week but joined the family at the House on weekends. They spent the holiday season at the House. Keeping families together during an illness is a shared goal of Children’s Hospital and Ronald McDonald House. The House stays full all year. Because there is an average of 10 families on the waiting list each day, guests are asked to limit their stay to 30 days. They can reapply to return to the home after a two-week break. The Family Room is a place where families can spend quiet time during the day and get snacks. There’s a children’s play area, a half bath, and staff and volunteers ready to help. More than 356,000 people have visited it since it opened in 2004, and it averages 2,100 visitors per month. “We’ve been part of the freestanding Children’s Hospital since the day the doors opened, and we’re very proud that we can be there for all families, not just the 32 that get to stay in our house every night,” Piercy said. More than 200 volunteers work in the House and Family Room, doing everything from checking in families, answering phones and household chores, Piercy said. One misconception about the House is that McDonald’s writes a big check that funds all operations, she said. 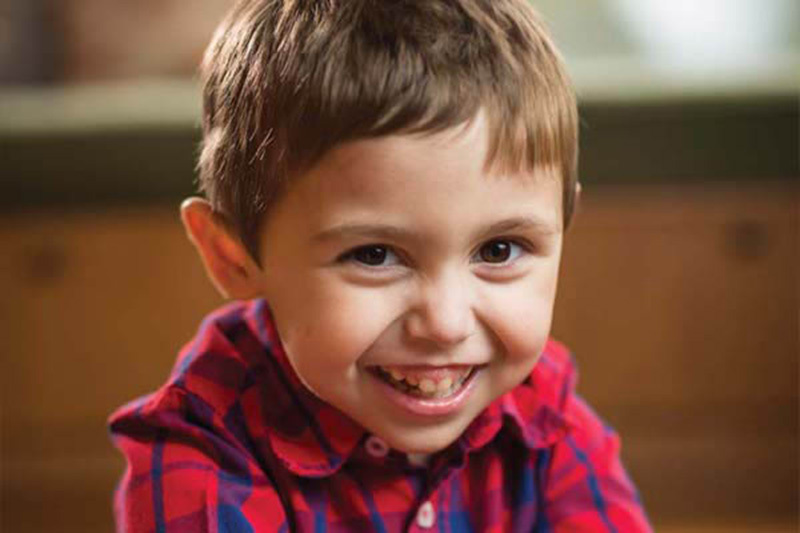 The Ronald McDonald House is sustained primarily by local donations of money and supplies by local donors, as well as support from local McDonald’s owner-operators. The House and Family Room have a regular wish list of supplies to keep these programs running. More information about volunteering and donating is available on the Ronald McDonald House website at rmhcnashville.com. José received his new heart on March 31, 2016. He’s out of the hospital and returns about every two weeks for a doctor’s visit, but just for the day. He said his interests include riding a bike, swimming and soccer.